Present this coupon to either Syracuse Bicycle located on Erie Blvd East, Syracuse or The Bikery in Baldwinsville or the Bike Loft on South Bay Road North Syracuse and receive a 10 discount on items purchased in their stores. A valid CNY Triathlon membership is required. The CNY Triathlon club has two metal bike boxes for shipping your bike for that distant triathlon you have been wanting to do. First , you must be a CNY Tri club member. Next board meeting is May 2, 2010, Sunday at 6:00PM location TBA on google groups message board. Fee: $25 club membership, and $4.00 daily parking fee or $31.50 beach season pass which can be obtained at entrance gate. Senior discount also available at gate. Club finale and end of season picnic and Kids triathlon: Sunday, September 12, 2010 at 9:00AM, post race family picnic at sandpiper shelter. Advanced cycling classes at Gold’s Gym, Dewitt first come first serve 446-0376. Swim workouts once a week at Nottingham High School. Nottingham has a 50M pool and they are willing to allow club members to use it. Stay tuned for more infor. The Downtown YMCA will be offering the following indoor cycle classes scheduled before the Mountain Goat Training Runs. Following are the dates and instructors. These rides will be held SATURDAY mornings 7am-7:45am. Cyclists can then proceed to the training run which begins at the MOST at 8am. The Y’s regular 8am – 8:45am Indoor Cycle class will also run as scheduled. We will again offer 2 race distances in 2 disciplines: Sprint & Intermediate / Triathlon & Aquabike (all races are USAT Sanctioned) as well as The Hoffman Rd. Hill climb, special youth rates, Cazenovia College dorm room rentals for Caz Tri racers & guests (just a few minutes walk from both the Village of Caz & the race venue!). NEW! : To celebrate the 10th Annual Caz Tri, we will also have an Elite Wave Race within the Sprint Tri with special awards & gifts specific to the Elite Wave. The Elite Wave Race is optional entry and intended for the serious competitive triathlete. Future announcements regarding the Elite Wave, Syracuse Ironman 70.3 Training Groups & Camps, news & other new additions to both Caz Tri Intermediate & Sprint races are forthcoming at cazenovia@cnytriathlon.org . 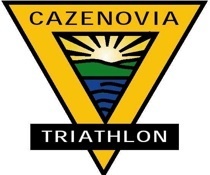 We look forward to seeing you in Caz August 15, 2010 swimming on flat Cazenovia Lake, biking within view of windmills & Cazenovia & Oneida Lakes, and running through the scenic village & town of Cazenovia. Participant cost is $199 for the entire 18-week program. Sign up to reserve your spot and plan on attending an informational session on Thursday, April 15th, from 7:30-8:30pm. An exciting new program brought to you by Syracuse Bicycyle, Onondaga Cycling Club and CNY Traithlon Club aimed at women who want to become more confident cycling on our beautiful roadways! Led by Syracuse Bicycle staff member Trish Dugan, you’ll have an opportunity to get all your cycling-related questions answered, from how to shift gears properly to finding the most comfortable pair of bike shorts. Women of all levels and welcome, no one will be left behind! No need to RSVP, just show up! Riders meet at Manlius Center Road parking lot at the corner of RT 290 snd Manlius Center Road. Participants must wear a helmet and sign a waiver. Volunteers are essential to the running of the CNY Triathlon Club, especially in regards to the Jamesville Beach Series and the annual Cazenovia Triathlon. As an encouragement to volunteer to keep the club running smoothly, we have developed a points incentive program. To earn points you must simply volunteer at a CNY Tri event. As you accumulate points you can cash them in for some sweet CNY Tri gear. Earn 8 points by volunteering at any position. Earn 5 points by stepping in to volunteer even if you are not scheduled to do so. Earn 2 points by racing a Wednesday night tri with a first-timer who might be a bit nervous. To receive credit for points you must sign the volunteer sheet available at the check-in table at Jamesville. Rich O’Neil will keep a list of all Caz Tri volunteers. You may cash in your points whenever you choose, or save them from year to year. There will also be an annual prize for the member with the most volunteer points. In closing, the CNY Triathlon Club is a volunteer organization operated and led by members of the club and supported by its members and sponsors. CNY Triathlon Club was formed to bring together people in the Central New York area to strengthen and advance the sport of triathlon; promote the educational pursuit of the triathlon and general physical fitness; represent the sport of triathlon within the community and publish and disseminate information related to the sport of triathlon.